In this engine, the products of combustion of air and fuel transfer heat to a second fluid which is the working fluid of the cycle. In the steam engine or a steam turbine plant, the heat of combustion is employed to generate steam which is used in a piston engine (reciprocating type engine) or a turbine (rotary type engine) for useful work. In a closed cycle gas turbine, the heat of combustion in an external furnace is transferred to gas, usually air which the working fluid of the cycle. Engine has one or more cylinders in which pistons reciprocate back and forth. The combustion chamber is located in the closed end of each cylinder. Power is delivered to a rotating output crankshaft by mechanical linkage with the pistons. A two-stroke cycle has two piston movements over one revolution for each cycle. An SI engine starts the combustion process in each cycle by use of a spark plug. The spark plug gives a high-voltage electrical discharge between two electrodes which ignites the air-fuel mixture in the combustion chamber surrounding the plug. In early engine development, before the invention of the electric spark plug, many forms of torch holes were used to initiate combustion from an external flame. 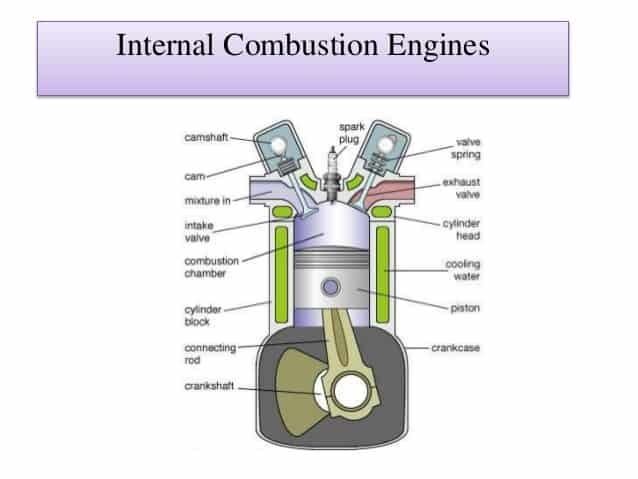 The combustion process in a CI engine starts when the air-fuel mixture self-ignites due to high temperature in the combustion chamber caused by high compression. a) Single cylinder and -Engine has one cylinder and piston connected to the crankshaft. common automobile engines. In-line engines are sometimes called straight (e.g., straight six or straight eight). Two banks of cylinders at an angle with each other along a single crankshaft. The angle between the banks of cylinders can be anywhere from 15°to 120°, with 60°-90° being common. V engines have even numbers of cylinders from 2 to 20 or more. V6s and V8s are common automobile engines, with V12s and V16s (historic) found in some luxury and high-performance vehicles. Engine with pistons positioned in a circular plane around the central crankshaft. The connecting rods of the pistons are connected to a master rod which, in turn, is connected to the crankshaft. A bank of cylinders on a radial engine always has an odd number of cylinders ranging from 3 to 13 or more. Operating on a four-stroke cycle, every other cylinder fires and has a power stroke as the crankshaft rotates, giving a smooth operation. Many medium- and large-size propeller-driven aircraft use radial engines. For large aircraft, two or more banks of cylinders are mounted together, one behind the other on a single crankshaft, making one powerful, smooth engine. Very large ship engines exist with up to 54 cylinders, six banks of 9 cylinders each. f) opposed cylinder or piston engines. Two banks of cylinders opposite each other on a single crankshaft (a V engine with a 180°V). These are common on small aircraft and some automobiles with an even number of cylinders from two to eight or more. These engines are often called flat engines (e.g., flat four). (a) Valves in head (overhead valve), also called I Head engine. (b) Valves in block (flat head), also called L Head engine. Some historic engines with valves in block had the intake valve on one side of the cylinder and the exhaust valve on the other side. These were called T Head engines. c) One valve in head (usually intake) and one in block, also called F Head engine; this is much less common. (a) Naturally Aspirated. No intake air pressure boost system. Two-stroke cycle engine which uses the crankcase as the intake air compressor. Limited development work has also been done on design and construction of four-stroke cycle engines with crankcase compression. (b) Multipoint Port Fuel Injection. One or more injectors at each cylinder intake.